Visited this pub on Mother's Day for a meal. There were 11 of us in our party & we arrived early for a 2o/c booking. At the time of booking we were told you can choose from the Mother's Day menu or Mediterranean menu. When we got there we were told it's only the Mother's Day menu. Everyone either chose the roast beef or pork. We we're then told that there was no roast pork left so roast beef it was apart from one who chose chicken breast. We waited around 45mins & eventually when it was served it was cold the beef was very rare which was not to everyone's taste & the vegetables were hard as in uncooked & cold. The portions were small to say the least & the meal was not at all worth the wait. But we were all soo hungry that were ate what we could & as we were celebrating Mother's Day & two family birthdays we didn't want to dampen the atmosphere. So we chose not to stop for sweet & left promptly. The waitress did ask how the meal was & received a response of "it' wasn't great" but she didn't ask us elaborate maybe because other customers were eating. We used to visit this pub regularly when the previous owners were there & the food was great but I'm afraid the new owner has a long way to go. Notionally I shouldn't really be reviewing a pub on the strength of an in-and-out visit and a very quick half, but I'll give it a go nevertheless. 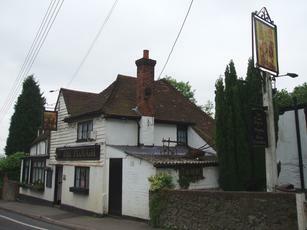 The Plough appears to be a fine, traditional, weatherboarded Kentish inn in a picturesque village. Once inside... That's exactly what one finds! No apparent frippery or pretence, just a solid, unspoilt local which was cosy and welcoming. Landlord seemed pleasant enough and the Adnams Bitter was well-kept. Food was served though we weren't in need of it at that stage; fairly standard but reasonable value as far as I could tell. All told, somewhere I'd certainly stop off at again if in the nearby vicinity. I imagine this would be ideal on a cold crisp Christmas Eve. Itrust the villagers make the most of their local at that time of year. Not been to the Plough for some time but ventured over there last night for a game of darts. I was being a lager sheep however Adnams Bitter was available - can't comment on the standard as nobody seemed to be drinking it. Small, traditional pub with 3ish rooms, one seemed to be laid out suggesting that they do evening food, lunchtimes certainally however. We took over the back room - this happens every Tuesday apparently as a very successful darts team plays out of the pub. The ceilings are a bit low however! Decent, proper pub though.